On our production environnement, BW process chains are triggered by events launched by jobs. 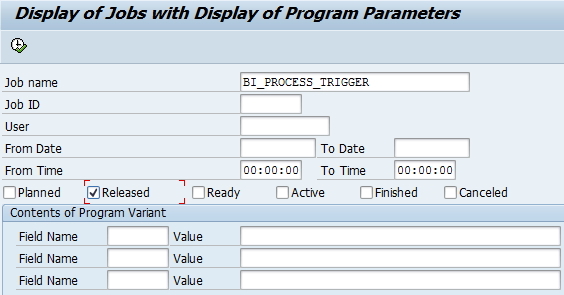 For a BW process chain to be properly triggered, it must have been activated AND scheduled. Transaction [RSPC] is used to activate and schedule a process chain, but it doesn’t not show if a process chain is well scheduled or if it has been removed from schedule. If the process chain is only activated or removed from schedule, then the process chain will not be triggerred by the desired event. Transaction [RSM37] allows at a glance to check that all the BW process chains are well scheduled on a production or any environnement.